This workbook of Latin phrases and mottoes is filled with exercises, projects, and games designed for students in grades 7-10. There are three parts to the workbook: sententiae or Latin phrases, abbreviations, and mottoes. The first section contains 180 Latin phrases, one for each day of the school year. There are five phrases on each page so that students can see a whole week's work at once. A variety of exercises helps students master each group of phrases. The second section of the workbook contains Latin mottoes of states, schools, colleges, and organizations. The third section reviews the 29 Latin abbreviations that were introduced in section one. All three sections are filled with interesting derivatives, engaging information, delightful facts, and ample exercises. Elizateth Heimbach '68, Bolchazy-Carducci Publisher, Inc. 2004. "Some people say that Latin is a dead language, but Latin is not dead; it is everywhere!" writes Elizabeth Heimbach in her introduction. Designed for beginning students who want to learn Latin phrases, this practical workbook is filled with exercises, projects and games for students in grades 7-10, but would also be useful for home-schooling families. The three sections — sententiae, abbreviations and mottos — are filled with interesting derivatives, engaging information, facts and exercises. There are five phrases on each page so that students can see a whole week's work at once. The motto section includes colorful phrases such as alis volat propriis (she flies by her own wings, Oregon's state motto), and descende ad terram (descend to earth, the motto of the 507th Parachute Regiment). The teacher's edition comes with a CD to aid in pronunciation. Heimbach ends her introduction with; "So, tempus fugit (time flies), carpe diem (seize the day), but festina lente (make haste slowly), and most of all, have fun!" Heimbach has been teaching Latin since her graduation from Bryn Mawr. She is a faculty member at The Madeira School in MacLean, Virginia, and has a master's from Ohio State University. LET'S READ This book contains 276 Latin phrases or abbreviations, including federal and state mottoes. It has a lot of explanations, examples, transitions, and accompanying exercises. An abundance of derivatives that flows through the explanations of the phrases. There are projects and games to keep one engaged in the learning process. It is a source of unique historical facts and of the ubiquity of Latin in our everyday lives. This book has everything in it to help you learn Latin. Elizabeth Heimbach wrote this workbook in a way that it could be completed in one year. She did this book to make it easier for people to learn Latin. Scholia Reviews 14 (2005) 41, Elizabeth Heimbach, Latin Everywhere, Everyday. A Latin Phrase Workbook. Illinois: Bolchazy-Carducci, 2004. Pp. 152, incl. 3 appendices. ISBN 0-86516-572-6. USS22.00. Gail Solomons, Classics, University of Cape Town Over the last decade in the United States of America Classics has experienced an unprecedented renaissance, both in schools and in universities. Latin especially is back in favour. According to the latest figures, some 130,000 students participated in the National Latin. Examination. [] In addition, courses on etymology, ancient mythology, and aspects of the ancient world have entered the curricula. Heimbach's book is an indication of this renewed interest in Latin and in things Classical. She has designed a student workbook that introduces students to Latin phrases, abbreviations, and mottoes, and provides exercises to enable the students to practise the correct use of these terms in English. The book is divided into three main sections, with a review chapter at the end of each. The first section introduces 180 Latin phrases, one for each day of the American school year, while the sections on mottoes and abbreviations are each intended to take half a year (eighteen weeks). Based on this reference to the school year, and judging by the academic level of the exercises, I think that Heimbach intends this workbook to be used by school-goers aged between ten and fifteen years, perhaps as a supplement to their English classes. This would not work for university students unless the exercises were considerably more challenging -- but as a supplementary school book, it has much to offer. [ The section on Latin phrases, Sententiae Latinae (pp. 2-73), is the most comprehensive, both in the number of phrases introduced and in the exercises given. Each phrase is accompanied by a literal translation, followed icy the more common meaning in everyday usage. A useful addition is the sentence Heimbach includes to illustrate how each phrase is used correctly in English. For manly of the phrases Heimbach adds some interesting extra information to reinforce the meaning and use-of the phrase, and sometimes to give some classical background. An example is no. 98 memento mori (p. 40) where she makes reference to the Roman triumph. In addition, Hieimbach has included in her explanations and in some of the exercises, many English words derived from Latin roots, rather than simply giving the Latin phrases -- this resonates with the title of the book. For easy reference, the phrases and related information are placed on the lent hand page and are used in exercises on the right hand page. These exercises vary: match a phrase with its meaning, fill in the blank using a Latin phrase which has been learned, circle the best meaning for each English word, write a definition of each English word and then write the Latin word from which it is derived. However, each exercise section begins with an exercise where the student is required to write the English meaning for each Latin expression on tae opposite page! This seems futile. Such exercises work in the review section, which tests what the student has learned and understood in Section 1, and is not merely a 'copy-paste' answer. The exercises that I think are particularly useful as a way of raising students' awareness of 'the ubiquity of Latin in our everyday lives'[] are the ones which require the students to work out what an English word means by using their knowledge of Latin, then checking the meaning in a dictionary, and finally writing a sentence to show that they have understood the meaning (for example, pp. 17, 21). 1 also like the exercise which has the students looking in magazines, newspapers, books, and on internet sites for examples of the phrases and abbreviations they have learned (p. 39). The second section on mottoes, consisting of thirty-two pages (pp. 86-i28) , is centred entirely on examples from individual states, schools, colleges, universities, organisations, and families in the United States. It is a pity that Heimbach has narrowed the focus so much as this section would not be useful to students in other countries. Perhaps she could have included mottoes from elsewhere and of other famous schools and universities, to give the book international appeal. What she has done, though, is added some additional interesting information in her explanation of the meaning of the mottoes, for example annuit coeptis -- this is one of the three mottoes of the United States, and she explains that this comes from Book 9 of Vergil's Aeneid and that annuit originally comes from the verb meaning 'to nod' and has come to mean 'to nod agreement/ to favour ' (p. 86). She has also included many English words derived from the Latin words used in the mottoes, for example si quaeris peninsulam amoenam, circumspice (p. 104). Here she explains the origin of the word 'peninsula' as a combination of paene meaning 'almost' and insula meaning 'an island' and goes on to give amoenam, meaning 'pleasant', as the root of the (English word 'amenity' which means `something that is pleasant but not essential This approach has allowed for a few of the exercises which follow to be more general, looking at roots and derivations, instead of having them all focused on the mottoes themselves. The third section is on abbreviations (pp. 130-38). There are some excellent sentences illustrating the use of these abbreviations, but all too few! This section comprises only five pages and deals with twenty-nine abbreviations, all of which were introduced in the first section, Sententiae Latinae. In her introduction (p. viii), Heimbach says that '(t)he abbreviations plus the mottoes are intended to take a half a year. Of course, you may want to skip around or to go slower or faster.' I am inclined to think that unless this advice is followed, the students will become bored by the last section. I had a niggling feeling that she had run out of a bit of steam or inspiration here. The review chapter which follows each of these three main sections contains exercises which test what has been learned in the preceding chapter. They are all short but comprehensive. The final chapter (pp. 140-44) gives a sample of a game which can be played by the students (basically a general knowledge quiz, but based on phrases, mottoes and abbreviations learned in the book) and a poster project and motto project. For the right age group these can be fur, but perhaps Heimbach could have incorporated more of these as exercises in each of the main sections or in the review sections, instead of isolating them at the end. The book ends with an appendix for each of the three sections (pp. 145-51). Here the phrases, mottoes and abbreviations are listed in alphabetical order, which makes for easy reference. Heimbach's book is a testament to the growing interest in the Classics in the United States of America. Her book suggests that this interest is being generated in schools, amongst the younger students, which is really uplifting. We in South Africa are envious! NOTES [] This is the figure given by the American Classical League/National Junior Classical League, as advertised on the back cover of the Classical World 97.4 (2004), edited by Matthew S. Santirocco. Latin in South Africa is not in such good shape! According to the Classical Association of South Africa, approximately one hundred students wrote she national Latin Matriculation examination, and while Classics-based courses are enjoying favour in many universities, these have not translated into the schools. [] Elizabeth Heimbach does not indicate a target readership, so I am making a judgement based on the exercises. Indeed a knowledge of these phrases and abbreviations is also useful for university students, but the content as presented in this workbook would be covered only as a supplement in a university etymology course. [] Quoted from the back cover of the book under review. 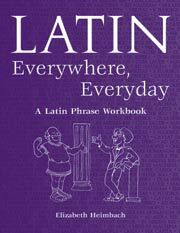 LATIN EVERYWHERE, EVERYDAY: A LATIN PHRASE WORKBOOK Latin Everywhere, Everyday: A Latin Phrase Workbook by Elizabeth Heimbach is a recipe for what students need in the beginning Latin classroom: ? one Latin phrase for every day of the school year with five on a page so that a week’s work can be viewed at one time, ? thoroughly stirred with derivatives, ? peppered lightly with abbreviations, ? salted with unique facts, information, projects, and games, ? cooked with mottoes of states, schools, organizations, and families, ? frosted with abundant exercises and review chapters The student workbook, Latin Everywhere, Everyday, is designed for students who want to learn Latin phrases, abbreviations, and mottoes and how to use them correctly in English. This practical volume can also serve as an introduction to Latin vocabulary.